The National Cadet Corps is a youth development movement. NCC has its Headquarters at New Delhi. Army, Navy and Air Force together groom the youth of the country into disciplined and patriotic citizens through NCC. 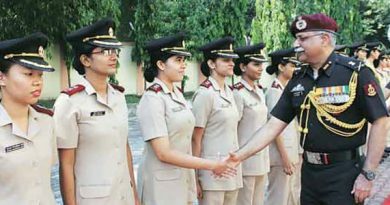 NCC recruits cadets from high schools, colleges and universities all over India. The Cadets are given basic military training in small arms and parades. The officers and cadets have no liability for active military service once they complete their course. The NCC provides opportunities to the youth of the country for their all-round development with a sense of Duty, Commitment, Dedication, Discipline and Moral Values so that they become able leaders and useful citizens. The NCC provides exposure to the cadets in a wide range of activities, with a distinct emphasis on Social Services, Discipline and Adventure Training. NCC Aim: NCC aims at developing discipline, character, brotherhood, the spirit of adventure and ideals of selfless service amongst young citizens. It also aims to enlighten leadership qualities among the youth who will serve the Nation regardless of which career they choose. It also motivates the young to choose a career in the armed forces. NCC Uniform: It can be seen in the above pic. NCC has its Pledge and Song as well. Candidates are enrolled for 2 years in the Junior Wing and 3 years in Senior Wing. NCC was established on 15 July 1948. The girls division was also established the same year, to give equal opportunities to school and college going girls. Following the 1962 Sino-Indian War, to meet the requirement of the Nation, the NCC training was made compulsory in 1963. In 1968, the Corps was again made voluntary. During Indo-Pakistani war of 1965 & Bangladesh-Pakistani war of 1971, NCC cadets were second line of defence. They organized camp to assist ordnance factories, supplying arms and ammunition to the front and also were used as patrol parties to capture enemy paratroopers. The NCC cadets also worked hand in hand with the Civil defence authorities and actively took part in rescue works and traffic control. After 1965 and 1971 wars NCC syllabus was revised. Rather than just being second line of defence, NCC syllabus laid greater stress on developing quality of leadership and officer like qualities. The military training which the NCC cadets received was reduced and greater importance was given to other areas like social service and youth management. A student desirous of being enrolled in the Junior Division should apply to the Headmaster/Principal of the school in the prescribed form. A student desirous of being enrolled in the Senior Division shall apply to the Officer Commanding of the nearest NCC Unit. Application will be reviewed by the headmaster or the commanding officer. If approved, candidate will go through a medical examination. Applicant or the Guardian(in case of minor) has to sign a declaration. In Every regular course of the Indian Military Academy, 32 seats are reserved for NCC ‘C’ certificate-holders who have passed the CDSE and have been declared successful by the Services Selection Board. NCC C certificate holders have a distinct advantage during training as well. A separate merit list is prepared for them. The NCC Special Entry Scheme offers Short Service Commission of 5 years (non-technical) in the Indian Army to graduates with 50% marks and NCC ‘C’ certificate. Indian Navy has 6 seats reserved per course for NCC C Certificate holders. There is No UPSC Exam, only SSB interview and there is two years age relaxation as well. Iandian Air Force has reserved 10% seats in all courses for NCC C certificate holders. And again cadets don’t have to appear in the UPSC Exam, just SSB. Bonus marks or points are awrded to NCC cadets in the selection process for ORs, Sailors, Airmen, Para Military Forces, Department of telecommunication and CRPF. Last but not the least, NCC changes one from a regular person to a well groomed, disciplined, fit and socially aware. It also cultivates a habit of serving others and understanding the importance being patriotic.